Cana Island is a unique little island that’s bounded by the waters of Lake Michigan on just three sides. Once on the island, you’ll find a calm, serene place that encourages walks along the beach, mid-day naps on the grass and picnic lunches (as long as you make sure to please take all your garbage with you)! 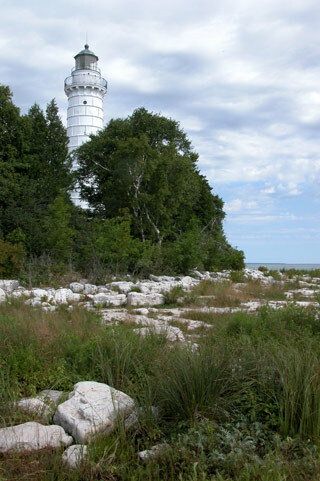 The light station grounds include a number of original buildings — the light tower, which is listed on the National Register of Historic Places; the octagon-shaped oil house; the lighthouse keepers’ home; a period brick privy; and a wooden barn. The small home and oil house include historic photo boards, hands-on exhibits and a video that brings the lighthouse to life. Those who wander the island will find the rock foundations of a boathouse and other structures. A 1920s stone wall, built by a former lighthouse keeper, encircles the east end of the island. Pass through the south gate in the wall and you might see large cables and steel sheets in the rocks. The artifacts are remnants of the freighter M.J. Bartelme that ran aground in fog in 1928. The buildings and grounds have been maintained by the Door County Maritime Museum for over 40 years. For more information about Cana Island, click here and or visit Terry Pepper’s site.